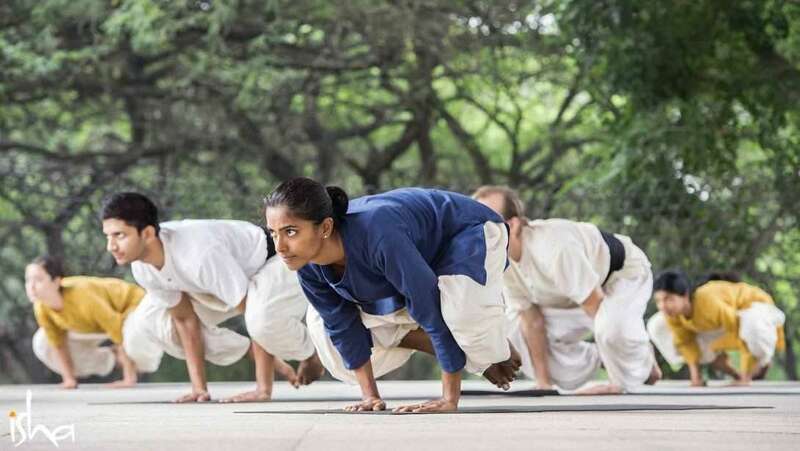 Hatha Yoga, Sadhguru explains, is one doorway to liberation, offering the possibility to transcend compulsiveness and move towards consciousness. Questioner: Is there a connection between meditation and hatha yoga? You said hatha yoga is a path by itself – can you elaborate on that? Sadhguru: There are many dimensions to hatha yoga. One fundamental aspect of it is to knead the body. You know, if you make bread or chapati, you need to knead the dough well for it to turn out well. Similarly, the quality of your meditation depends on how well-kneaded you are, not only through hatha yoga or asanas, but by life itself. Life is kneading you in so many ways. You can either enjoy it or suffer it. You can either mature and blossom, or get crushed by the process. This is the choice you have. Hatha yoga is a kind of kneading – not just of the muscle but of every aspect of who you are. Hatha yoga is a kind of kneading – not just of the muscle but of every aspect of who you are. What you refer to as karma is embedded in every cell of the body and in every aspect of your energy. This becomes apparent when, in the same process or activity, the energies of different individuals behave differently, depending on the type of memory their energy system carries. Kneading means trying to make your system so malleable that it has no power to influence you. You are taking charge of your life through the body. There are different ways to take charge of your life – one way is through the body. Physically, it may be a little harder, but it is a sure path, because you immediately know what works and what does not. If you try to take charge of your life through the mind, you do not know whether you are going forward or backward. You do not know whether you are becoming malleable or crusty. You may think you are doing well, but people around you may say otherwise. The body never lies – that is a good thing about it. The mind tells you all kinds of lies, all the time. People who do not trust the mind start off with the body. Hatha yoga can be an ultimate path, because body, mind, energies, and being are not separate entities. You can approach the same thing from different ends. The physical entry is a sure way, but a longer one. It is not even harder, except if you practice hatha yoga only every now and then. If you only do it once in a way, then bending may be a problem. If you do it every day, you will see sadhana is not hard at all. Hatha yoga is just one more doorway to ultimate liberation, but it is physical in nature. If you are in good physical condition, it is an effortless and beautiful way to go. If you have asana siddhi, which means you can stay in a posture comfortably and stably for long periods of time, meditation will be effortless. If you struggle with meditation, it is because certain parts of the body and certain aspects of the mind do not cooperate as they should. The problem is you have not trained your body and mind. Sitting down on the floor, you realize in what state your body is. Hatha yoga means keeping everything in the system flowing. If you do the right kind of hatha yoga, you will live long, because you do not allow death to crop up in your system. Otherwise, rigor mortis is slowly creeping in – slowly, the body is becoming stiff. Hatha yoga can lead to asana siddhi. If you attain to asana siddhi, your body becomes still. Hatha yoga can make meditation a joy. Likewise, if you train your mind to stay focused on something, meditation will be effortless. If both your body and your mind are well-trained, meditation will not be difficult. Hatha yoga can lead to asana siddhi. If you attain to asana siddhi, your body becomes still. Stillness is of many different levels. If you become totally still, you are in meditation, without any effort. The only effort is managing to sit in one place and to keep your mind where you want it. Right now, both the body and the mind are not listening to you – they are hopping all over the place. If I make you sit here for one-and-a-half hours, your legs will be telling their own story. If I make you sit for two hours or more, your bladder will be telling its own story. You will not care about heaven or enlightenment anymore – there will be only one place you want to go. For some people, it is food; for others, it is sexuality or some other physical compulsion that rules their lives. Once these compulsions come up, everything else gets obliterated. There are many ways to fix this. Once, a young woman was in a cinema. While the movie was on, she went to the bathroom. When she came back, she tapped a man who was sitting at the end of the row on the shoulder and asked him, “Did I step on your toes when I left?” He said, “Yes,” thinking she wants to apologize. She said, “Well, then this is my row.” People display compulsions in so many different ways. When you have a body, some compulsions are there – you have to eat, sleep, go to the bathroom, and things like that – but that should not determine the direction of your life. One meaning of the word hatha is being adamant. No matter if your body, mind, emotions, or your family like it or not, you get up in the morning and do your hatha yoga. One meaning of the word hatha is being adamant. No matter if your body, mind, emotions, or your family like it or not, you get up in the morning and do your hatha yoga. It takes a certain adamancy to break the compulsiveness of your physical body. The body has a million years of evolutionary history behind it. It has its own tendencies, intentions, and compulsions. It will not give in easily. At the ashram, generally, there are two meals a day. Between the first meal at ten o’clock in the morning and the second one at seven o’clock in the evening, people get hungry. They come and sit in the Biksha Hall for dinner. The volunteers serve and once the food is in front of you, you want to eat. But you wait for everyone to be served, then everyone does an invocation together, and only then you eat. All this is part of hatha yoga. You are adamant about not only keeping the body aware but the mind too. The physical needs of the body are still there, but you slowly overcome the compulsiveness. If there is no compulsiveness in your system and you sit here, without the need for instructions, you are in meditation. What you are trying to work through are the compulsive cycles of karma. It may take a certain amount of time and effort to break all compulsiveness by using your body alone, but it is a fantastic thing to do. Editor’s Note: A version of this article was originally published in Isha Forest Flower. Download as PDF on a “name your price, no minimum” basis or subscribe to the print version.